Logistic problems in Calloa? Are the striking dockworkers at the port disruptive? Union official disputes claim of minimal strike impact at Callao. 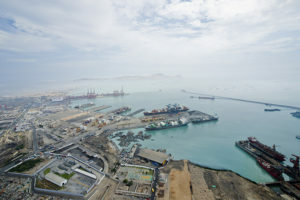 Replacement labor used by APM Terminals to fill in for striking dockworkers at Peru’s Port of Callao has started to affect container operations, according to the labor union’s spokesman. On May 13, roughly 650 to 700 dockworkers went on an indefinite strike at the port, the largest container gateway for the west coast of South America. APMT’s use of a new electronic roster system that replaced a paper-based system to control worker allocation has been at the center of the dispute, according to APMT. Although container gantry crane operators are not involved in the strike, Vargas claimed that many of those on strike are part of teams that guide containers into and out of the ships and lock and unlock containers to and from the stacks. He alleged that APMT’s use of the Peruvian Navy to replace union labor for APMT’s container, general cargo, and ro-ro operations at the port is both unsafe and illegal. Source: Contact John Gallagher at john.gallagher@ihs.com. It’s allergy season – how is logistics keeping up?